Over the past month we’ve been talking to many product and UX leaders about the state of user research in their organizations. Apart from anecdotal conversations and interviews, we collected over 100 responses to a short survey which results may surprise you. We presented some of the findings at the Design and Research Ops Summit in New York last week, but wanted to share an in-depth look at the results and hopefully shed some light onto why most organizations struggle to do effective customer research often. Question 1: Do you think your team does enough user research? A common sentiment shared amongst 80% of the UX professionals we surveyed is that their team doesn’t do enough user research. This is not surprising at all, we have seen similar results in research done by Patrick at ProfitWell with a larger pool of respondents. 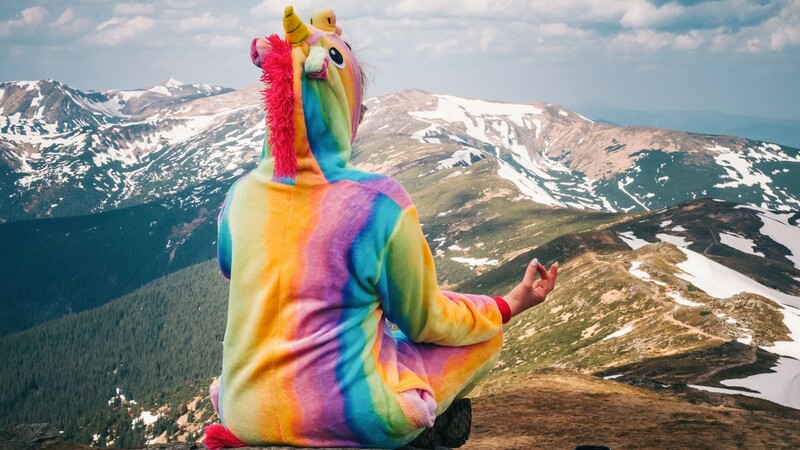 Most product teams would agree that understanding their customers is the most important activity they should be focusing on however, when it comes to prioritising learning over delivery it seems that very few organizations are truly intentional about it. Question 2: What is stopping your team from doing more research? Working in an environment where research is said to be valued but it is not given enough time and resources to flourish can feel very dysfunctional at times and ultimately can become a source of stress and anxiety for those who are hired to do the research itself. Question 3: Are you satisfied with the way user research is used in the development process? Responses were closer to 50/50, but we still see a majority of respondents saying they are NOT satisfied with the way user research is being used in the development process. So far we have a significant portion of people who are not happy with the amount of research that is done and not happy with the way it is used. Regardless of the size of your business or your role, somebody is doing some kind of customer research in your organization, and that person is most likely to feel the same way. What is your business doing about it? Question 4: What would need to change for you to feel satisfied with the way user research is used? Most responses pointed to a lack of team alignment, lack of awareness about the importance of research and ultimately to a development process that seems to be more focused on deadlines and deliveries than on the quality of outcomes. Question 5: How much do you think other team members (outside of the product team) are aware of the insights generated in the user research process? 56% of respondents believe that people outside of the product team know very little or nothing about insights generated from user research. This seems to indicate that not only product teams are missing out on important insights but also the rest of the organization is not learning from the scarce user research that takes place. So far it is not looking very positive so we decided to ask about what is actually working. Question 6: Have you implemented any tactic that has helped you engage your team with user research insights? The responses to this question were interesting. We got a lot of people flat out saying “no”, they hadn’t implemented any kind of tactic to increase engagement. The vast majority of the responses were centered around meeting with others face-to-face early and often throughout the entire development process. Why is it so hard to embed customer research in the development process? We think the challenge starts at the very early stage of the business. When you’re small, research is typically left up to the founder(s) because they wear multiple hats and typically haven’t hired any UX practitioners. At this stage, user/customer research typically consists of customer interviews, feedback emails, and basic surveys — relatively simple methodologies that have decent potential for surfacing insights. The biggest challenge for founding teams of small companies is transferring knowledge to the rest of the team; it’s one thing to mention insights in a monthly meeting, but it’s difficult to build that knowledge into the fabric of your company. 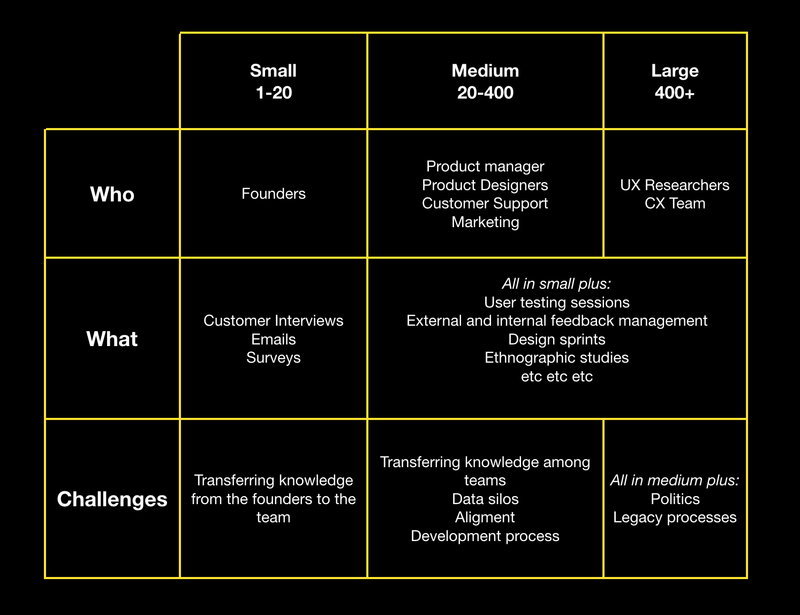 Medium-sized companies usually have more specialised roles that do user research, whether they call it that way or not. For example, you would typically have marketing, customer support, design and product folks executing on a variety of methods that are usually more sophisticated. At this stage, the challenges become more about transferring knowledge between different teams and ensuring research insights are incorporated into the product’s decision-making process. Having more people doing research in silos does not equal more insights. The politics around what type of research is useful and who “owns” customer understanding start here. Large enterprises specialise even further, hiring specifically for user researchers and building teams dedicated to user/customer experience. Methodologies used in earlier stages continue to be used, and in-house or original methods of research may be developed to increase the team’s capabilities. At this stage, you’ll encounter the same challenges as before, in addition to challenges brought about by internal politics, legacy processes and the inevitable complexity of large scale-teams. At each stage, you will find that most people try to solve the problem by evangelising research. The focus tends to be around communicating the importance of user research, however, most product and research teams grow frustrated as their evangelisation process seem to build awareness but not tangible change in processes and resources. 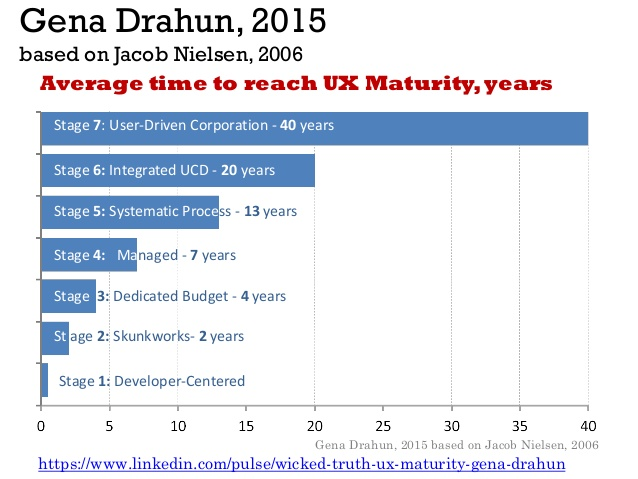 It takes many years to move an organization through the different stages of UX maturity. Although evangelising user research it is indeed a strategy for aligning the organization around the customers, it also largely depends on the ability of the evangelist to tell stories and use data to prove the value. If the evangelist is not able to execute on research successfully, the chances of succeeding at convincing others about the importance of research are also reduced. Flipping the script — prioritising Research Operations over evangelising research. It is natural to think that the business needs to reach a certain level of UX maturity before they begin to improve the processes behind the research. And on first consideration, this makes sense — why focus on optimizing research when you’re still figuring out how to incorporate research into the development process? Here’s why — focusing on improving your current research process and eliminating inefficiencies in the process might actually help you reach UX maturity faster. By investing time, effort, and money into research operations, user research can be done more often, more efficiently, and more effectively. This increase in the research quantity and quality may expose more of the organization to the value of user research, resulting in increased investment into the research team (whatever that means in your company) as a whole. Customer segmentation — can you find the right customers to talk to? Protocols for engaging with customers — does your company have rules and processes for reaching out to customers? Can you make it easier? Recruitment — do you have a consistent and ideally low cost channel to recruit participants for testing? Properties and events — Is your team tracking the right product metrics? Do you know which actions your users take? Data access — does your team have easy access to the data they need? Do you have a place to share all user research insights easily? Protocols and support material to educate non-researchers — do non-researchers receive any training about utilizing research insights? Communication channels to share research and gather inputs — are internal feedback loops a part of your organization’s communication strategy? In order words, can different people in the business share inputs and ideas with the product team without overwhelming them? Tooling — do researchers have the tools and technology they need to succeed? 👉Coming next: How do you know Research Ops is working? Some of the metrics you can start measuring — Subscribe to this blog to receive updates. Originally published at blog.nomnominsights.com on November 19, 2018.